Cheryl D. Mills (born 1965) is an American lawyer and corporate executive. She first came into public prominence while serving as deputy White House Counsel for President Bill Clinton, whom she defended during his 1999 impeachment trial. She has worked for New York University as Senior Vice President, served as Senior Adviser and Counsel for Hillary Clinton's 2008 presidential campaign, and is considered a member of Hillary Clinton's group of core advisers, self-designated as "Hillaryland". She served as Counselor and Chief of Staff to Hillary Clinton during her whole tenure as United States Secretary of State. After leaving the State Department in January, 2013, she founded BlackIvy Group, which builds businesses in Africa. On September 3, 2015, she testified before the House Select Committee on Benghazi regarding her and former Secretary Clinton's actions and role during the 2012 Benghazi attack, although the fact that she no longer held a security clearance may have limited the scope of the committee's questioning. Mills is the daughter of a Lieutenant Colonel in the U.S. Army and grew up on Army posts all over the world, including Belgium, West Germany, and the U.S. She attended Eleanor Roosevelt High School in Greenbelt, Maryland. Mills received her B.A. from the University of Virginia in 1987, where she was Phi Beta Kappa, and her J.D. from Stanford Law School in 1990, where she was elected to Stanford Law Review. She worked as an associate at the Washington law firm of Hogan & Hartson. While there, she represented school districts seeking to achieve racial integration per Brown v. Board of Education. After serving as Deputy General Counsel of the Clinton/Gore Transition Planning Foundation after Clinton's 1992 election, she served as Associate Counsel to the President in the White House from 1993 on. Until the impeachment, she was little known to the public, although she did rise to public attention when a burglar reportedly broke into her car and stole documents relating to the handling of the late Vincent Foster's papers related to the Whitewater controversy, as well as the 1993 federal raid on the Branch Davidian compound in Waco. During the impeachment trial, the BBC reported that she was "widely regarded as the shining star of the defense team, and gave an effective presentation on President Clinton's behalf on the second day of defense arguments." Other media outlets also viewed her work quite favorably. Her presentation to the Senate focused on refuting the obstruction of justice charge and the House Managers' claim that failure to convict the President would damage the rule of law. Her summation became known for its endorsement of Clinton's record with respect towards women and minorities; she said, "I stand here before you today because President Bill Clinton believed I could stand here for him ... I'm not worried about civil rights, because this President's record on civil rights, on women's rights, on all of our rights is unimpeachable." After Clinton was acquitted, Mills was offered the White House Counsel position when Charles Ruff stepped down, but she declined. After leaving the Clinton administration, Mills took a break from the practice of law. From 1999 to 2001, she served as Senior Vice President for Corporate Policy and Public Programming at Oxygen Media. By 2002, she was working for New York University (NYU). While at NYU, she played a central role in the university administration's efforts around union contracts with adjunct faculty and graduate students. The Washington Post reported in October 2015 that, during Mills' first four months at the State Department, she continued to work at NYU on a part-time basis, negotiating with officials in Abu Dhabi to build a campus in the United Arab Emirates city. She worked for no pay in those first months at the State Department, and was officially designated as a "temporary expert-consultant", which allowed her to continue receiving outside income while serving as Clinton's Chief of Staff. On her financial disclosure forms, she reported $198,000 in income from NYU in 2009, during the period her university work overlapped with her time at the State Department, and that she collected an additional $330,000 in vacation and severance payments when she left the university’s payroll in May 2009. Additionally, Mills remained on the Clinton Foundation’s unpaid board for a short time after joining the State Department. Another Clinton aide, Huma Abedin, spent her final six months employed as Clinton’s deputy chief of staff in 2012, while also simultaneously employed by the Clinton Foundation. As has Abedin's, Mills’ employment arrangement has raised questions regarding potential conflicts of interest, in Mills' case about how one of the State Department’s top employees set boundaries between her public role and a private job that involved work on a project funded by a foreign government. Under Federal ethics laws, employees are prohibited from participating in matters that would have any direct and predictable effect on themselves or an outside employer. Mills told the Washington Post that she did not “recall any issues” at the State Department that would have required her recusing herself, and said she would have consulted with the ethics office if such an issue had come up. Nick Merrill, a spokesman for the Clinton campaign, declined to comment. In summer 2016, CNN reported on another ethical question pertaining to Mills' relationship with the Clinton Foundation during her tenure at the State Department: In 2012 Mills had traveled to New York City in order to assist the foundation by conducting interviews in a high-level candidate search. Mills' attorney emphasized that she had assisted on a strictly volunteer basis, and was not paid for her services or travel; a State Department spokesperson indicated that such an undertaking was not in conflict with federal ethics rules. As an employee of the United States Department of State, Mills was Counselor to the Secretary of State; it is unclear under the Federal Rules of Evidence whether attorney–client privilege applies to these communications in the private and public sectors. Law Professor Patricia Salkin writes in The Urban Lawyer that "government lawyers would be well advised to caution their government clients, particularly if the client is believed to be an individual public official, about the uncertainty of the privilege for what may be about to be disclosed". Mills' attorney raised this protection in May 2016, as Mills was being questioned by the Federal Bureau of Investigation in connection with the investigation of Clinton's private email server. In 2002, the United States Court of Appeals for the Seventh Circuit reiterated that government lawyers may not exercise an attorney-client privilege in an effort to shield information from a grand jury. On June 18, 2018, US Senators posed questions regarding Ms. Mills and her colleague Heather Samuelson within the unprecedented relationships between her government duties and her private practice in light of possible scenario of obstruction of justice to Michael Horowitz and Christopher Wray. [non-primary source needed] Horowitz indicated that the decision to delete emails would have been limited to "non-work related" emails. FBI boss Wray said that he could not come up with a scenario concerning a precedent of such relations between "witnesses" or "suspects" in response to Senator Whitehouse. Mills oversaw the Department’s interagency global hunger and food security initiative (Feed the Future) and diplomacy and development efforts in Haiti working closely with USAID and others across the government. She served as the United States' representative on the Interim Haiti Recovery Commission (IHRC). Shortly after taking office Secretary Clinton asked Mills to lead an interagency consultation of current agriculture and food security efforts. The subsequent strategy became (Feed the Future). The Obama administration pledged $3.5 billion over three years to boost agricultural productivity. Describing the importance of food security Mills said, "We are always worried whenever people can't feed themselves. And particularly worried when that actually might translate to destabilization of a country. It is one of the reasons why this program is such an important one." In January 2011, Mills joined Prime Minister Jean-Max Bellerive, the Inter-American Development Bank, Sae-A and the Interim Haiti Recovery Commission, headed by Bill Clinton, to announce the construction of Caracol Industrial Park in Northern Haiti. Its first tenant was projected to create 20,000 jobs alone. She has said, "I feel a special connection to Haiti and the Haitian people. The power of Haitian heritage and the strength of the Haitian people is tremendous. And, Haiti holds a unique and rich role in the history of African Americans." In her keynote speech at the ribbon-cutting ceremony at Caracol Industrial Park on October 22, 2012, then-Secretary of State Hillary Clinton praised Mills as "a real driver of our government’s support for everything that we see here today". Mills founded BlackIvy Group and is CEO of BlackIvy group, a company which builds and grows enterprises in Africa. Her close professional relationship with Sae-A chairman Woong-ki Kim led them to cooperate with Costa Rican president Luis Guillermo Solís cutting the ribbon at the new Sae-A factory in Costa Rica. Throughout her career, Mills has been active in community service and civic affairs. In 1990, she worked with DCWorks, a non-profit organization that supported the academic and social development of underprivileged high school students of color. She served on the Boards of the See Forever Foundation, National Partnership for Women and Families, the Leadership Conference on Civil Rights Education Fund, the Jackie Robinson Foundation, the Center for American Progress, and the William J. Clinton Presidential Library Foundation. In 2010, Mills received UVA's Distinguished Alumna Award. In the corporate world, Mills served on the board of Cendant Corporation. On March 26, 2014, Elle magazine honored Mills at the Italian Embassy in the United States during its annual “Women in Washington Power List” celebration. ^ a b c "President Clinton's best defence". BBC News. 1999-02-10. Retrieved 2006-11-26. ^ a b c d Katherine Q. Seelye (1999-08-09). "Chief Lawyer for White House Heads Back to Private Practice". The New York Times. Retrieved 2008-01-01. ^ a b c d e f g h i j "Cheryl Mills". New York University. Retrieved 2008-01-01. ^ a b Michelle Cottle (2007-08-06). "Hillary Control". New York. Retrieved 2008-01-01. ^ a b "Cheryl Mills". U.S. Department of State. Archived from the original on 2011-06-09. Retrieved 2011-06-16. ^ a b c McIntire, Mike (October 16, 2016). "Haiti and Africa Projects Shed Light on Clinton’s Public-Private Web". New York Times. Retrieved 2016-10-17. ^ Schmidt, Michael S. (September 3, 2015). "Cheryl Mills, Hillary Clinton Aide, Appears Before House Panel". Msn.com. Retrieved 2016-04-09. ^ Bade, Rachel, and Josh Gerstein (September 2, 2015). "Benghazi panel denies ex-Hillary aide's request to publicly testify". Politico. www.politico.com. Retrieved 2016-10-16. ^ a b c Robin Toner (1999-08-16). "For a Tough Clinton Lawyer, a Tough Decision to Leave". The New York Times. Retrieved 2008-01-01. ^ a b c d David Von Drehle (1999-01-21). "Mills: A Brand New Legal Star on the Rise". The Washington Post. Retrieved 2008-01-01. ^ a b "See Forever Board of Directors". See Forever Foundation. Archived from the original on 2008-04-02. Retrieved 2008-01-01. ^ "Defense Who's Who". The Washington Post. January 19, 1999. Retrieved 2008-01-01. ^ Tim Graham (1999-01-28). "Cheryl Mills: Liar, Obstructor...Heroine?". Media Research Center. Archived from the original on 2002-11-25. Retrieved 2008-01-01. ^ Karen W. Arenson (2002-05-01). "Cabinet's New Look at N.Y.U." The New York Times. Retrieved 2008-01-01. ^ Arenson, Karen (May 8, 2004). "Benefits Outlined For Adjuncts At N.Y.U." New York Times. Retrieved 10 December 2013. ^ "Memo to the Community from Cheryl Mills & Terrance Nolan" (PDF). March 31, 2005. ^ a b Watters, Susan (26 March 2014). "Gucci and Elle Honor Women in Washington Power List". WWD. Retrieved 28 March 2014. ^ Amie Parnes (2009-04-24). "Gatekeeper: Cheryl Mills". Politico. Retrieved 2011-06-17. ^ a b Griffin, Drew, and David Fitzpatrick (August 11, 2016). "Top Clinton State Department aide helped Clinton Foundation". CNN. Retrieved 2016-10-16. ^ Clark, Kathleen (May 20, 2008). "GOVERNMENT LAWYERS AND CONFIDENTIALITY NORMS" (PDF). Washington University Law Review. p. 1037. Archived from the original (PDF) on 2016-06-23. Retrieved May 14, 2016. Professor of Law, Washington University in St. Louis: "There is no single answer to the question of client identity for government lawyers." ^ Salkin, Patricia (2003). "The Urban Lawyer: Vol 35 No. 2, Chapter: Beware: What You Say to Your Government Lawyer May Be Held Against You—The Erosion of Government Attorney-Client Confidentiality" (PDF). The University of Missouri-Kansas City School of Law. p. 302. Retrieved May 14, 2016. ^ Zapotosky, Matt (May 10, 2016). "Clinton aide Cheryl Mills leaves FBI interview briefly after being asked about emails". Washington Post. Also: synopsis/link in 'cheat sheet' of The Daily Beast. Both retrieved 2016-10-17. ^ Wood, Diane (April 23, 2002). "A WITNESS BEFORE THE SPECIAL GRAND JURY 2000-2 No. 01-3386". Findlaw.com. Retrieved May 14, 2016. "....government lawyers have a higher, competing duty to act in the public interest. Lindsey, 158 F.3d at 1273; Comment to ABA Model Rule 1.13 (noting that government lawyers may have higher duty to rectify wrongful official acts despite general rule of confidentiality). They take an oath, separate from their bar oath, to uphold the United States Constitution and the laws of this nation (and usually the laws of the state they serve when, as was the case with Bickel, they are state employees). Their compensation comes not from a client whose interests they are sworn to protect from the power of the state, but from the state itself and the public fisc.2 It would be both unseemly and a misuse of public assets to permit a public official to use a taxpayer-provided attorney to conceal from the taxpayers themselves otherwise admissible evidence of financial wrongdoing, official misconduct, or abuse of power. Compare Nixon, 418 U.S. at 713, 94 S.Ct. 3090 (qualified executive privilege applies in the face of a criminal investigation). Therefore, when another government lawyer requires information as part of a criminal investigation, the public lawyer is obligated not to protect his governmental client but to ensure its compliance with the law. ....a government attorney should have no privilege to shield relevant information from the public citizens to whom she owes ultimate allegiance, as represented by the grand jury." 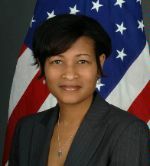 ^ Cheryl Mills (2010-03-10). "The Importance of Agriculture in Confronting Hunger, Poverty, and Unemployment in Haiti". Huffington Post. Retrieved 2011-06-17. ^ Weekend Edition (2011-06-12). "Clinton's Africa Tour Underscores The Power Of Women". NPR. Retrieved 2011-06-17. ^ Jose De Cordoba (2011-01-11). "Planned Haitian Textile Park Provides Hope for Jobs". Wall Street Journal. Retrieved 2011-06-17. ^ Lois Romano (2010-05-10). "State Department's Cheryl Mills on rebuilding Haiti". Washington Post. Retrieved 2011-06-17. ^ Clinton, Hillary (October 22, 2012). "Remarks at the Caracol Industrial Park Opening Ceremony". US State Department. Archived from the original on 2016-10-13. Retrieved October 21, 2016. ^ "Team". Black Ivy Group. Retrieved 2016-10-17. ^ "U.Va. Distinguished Alumna Award Goes to Cheryl D. Mills, Secretary of State Hillary Clinton's Chief of Staff". University of Virginia. 2010-02-11. Archived from the original on 2012-08-05. Retrieved 2011-06-17. ^ "Trapped in the 'Marzipan Layer': Why Women Can't Make it to the Top". Daily Beast. 2011-03-11. Archived from the original on 2011-09-14. Retrieved 2011-06-17. This page was last edited on 9 January 2019, at 19:43 (UTC).